While you'll find all the world's largest design firms and companies at the main halls in Rho Fiera during Milan Design Week, if you take a walk off the beaten bath and head to the Salone Satellite at the Milan Furniture Fair, you'll find lots of exhibition space dedicated to new and budding designers. Each year the show features cool designs from around the globe united under one theme. This year the Satellite show focused on exploring the theme of "Design & Technology" as a tribute to Steve Jobs. But there weren't any robots or new touchscreen gadgets on display here. Instead, 17 participating design schools and 750 designers almost unanimously looked into simple technologies, using them to explore the qualities of the materials they employed. The work on display was wonderfully straightforward, and the designs to speak for themselves. Take a look at some of our favorite pieces ahead! 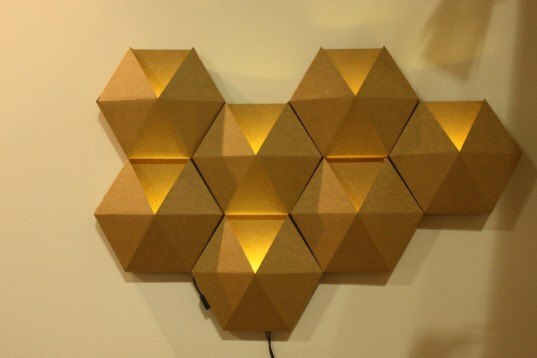 AmbiHive is a beautiful new design from NBT Studio that merges an ambient wall light and a speaker. The piece is made with ICB (Inverted Corrugated Board), LEDs and a ceramic sound chip. The chip, which is mounted to ﻿the underside of the board, causes the surface to vibrate and sound comes out of each of the hexagons. The LED lights are wonderfully synchronized with the music. 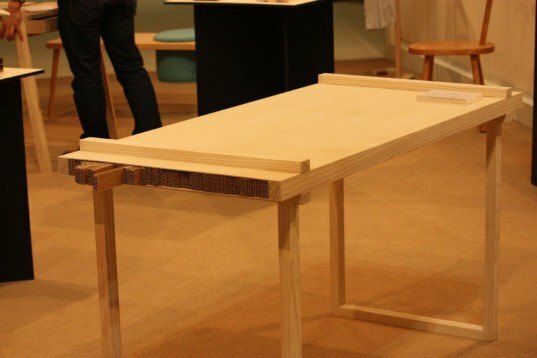 Taiwanese NBT Studio created a new line of cardboard furniture that also boasts an easy-to-assemble design. Dubbed “Reincarnazione”, the furniture range is made entirely with eco-friendly materials such as ICB (Inverted Corrugated Board), PET fabrics made with recycled water bottles, and natural latex. Seen above is “Canvas”, a comfortable sofa decorated with beautiful prints that can be fully customized. 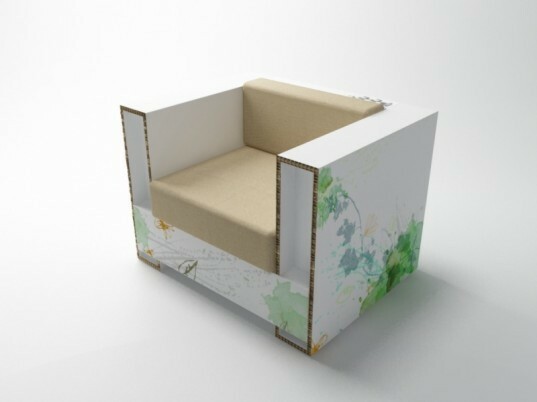 The sofa structure is made of ICB (Inverted Corrugated Board) and comes in a flat pack for a tool-free assembly. The cushions are natural latex and the upholstery recycled PET fabric. German designer Thomas Schnur presented a delightful collection of objects made using conventional materials. Schnur, who has a passion for no-frills design, used straightforward assembly techniques and one color for each object. The Fragment Table seen above was made with four metal brackets, four timber sections and rods, four plastic tracks, four plastic plugs and a table top — they all lock together without screws or glue. The table has been painted in a very cool, retro-looking pale green. ﻿﻿The Rubber Table by Thomas Schnur is a small coffee table made with standard rubber plungers and foam rubber, dyed to match the color of the plungers. The small table can be handily placed on an inclined surface and since it floats, it can also be used in the pool! D-Vision, the Israeli internship program for industrial design and product development sponsored by the Keter Group, presented “Soft Comfort”. The exhibit included eight seating objects that explore the notion of comfort. Seen above is “Idea 32”, a fascinating origami foam stool that comes in different colors and heights. It is made by pouring colored foam into a hand-folded foil mold. The name Idea 32 comes from the 32 attempts that were required to find the right combination of materials. 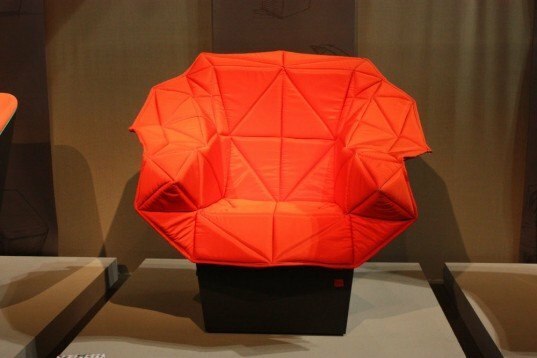 Foldigon is an outdoor table that turns into an armchair by unfolding the upholstered polygons stored in its interior. Inspired by the Japanese Bento box, the table is a simple cube when closed, and colorful and exuberant blossom when open. “Outside In” is a table that recycles its own packaging. Made with white ash and plywood, the table comes flat-packed in corrugated cardboard that can be pulled apart and stacked in sheets to create a solid tabletop. The cardboard is slid into the top of the frame and then clamped between two timber pieces with just four screws. This unique design comes from Design Soil of the Kobe Design University . Delightful designs in natural fibers were created by Chinese design studio From Yuhang. 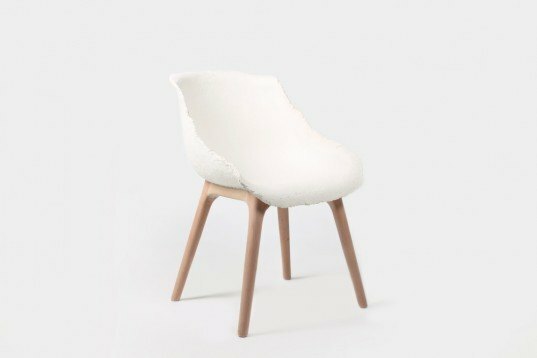 The “Gu” chair is made with bamboo paper molded into a seat, and supported by an untreated timber structure. The seat shell has a wonderfully smooth surface, which contrasts nicely with its rough outside surface. 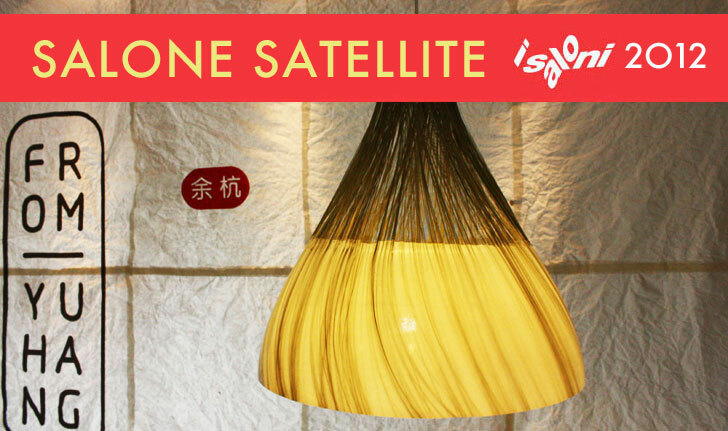 The Ning lamp by Yuhang is a beautiful combination of traditional and new materials. 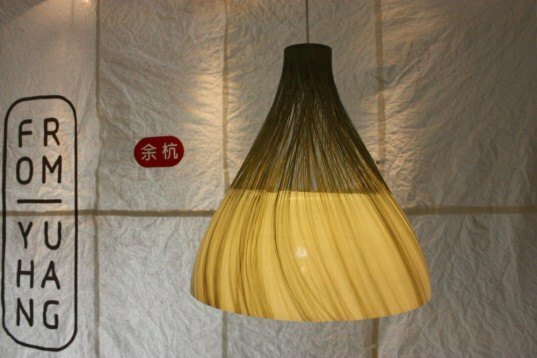 It is made with thin bamboo strings, and held together at its base by a mix of recycled porcelain powder and resin. 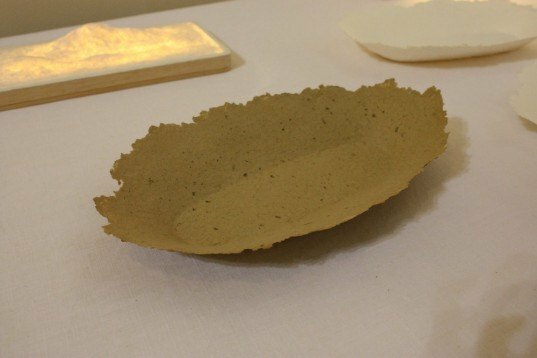 The Yun by Yuhang tray is made with bamboo paper from the Yuhang province in China (the same place where the design company is based) following an ancient production process. The rigid shape has been achieved using the natural qualities of the bamboo fiber without any additives. Delightful designs in natural fibers were created by Chinese design studio From Yuhang. The "Gu" chair is made with bamboo paper molded into a seat, and supported by an untreated timber structure. The seat shell has a wonderfully smooth surface, which contrasts nicely with its rough outside surface. D-Vision, the Israeli internship program for industrial design and product development sponsored by the Keter Group, presented "Soft Comfort". The exhibit included eight seating objects that explore the notion of comfort. 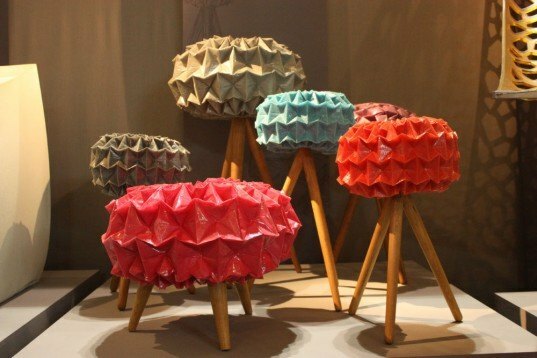 Seen above is "Idea 32", a fascinating origami foam stool that comes in different colors and heights. It is made by pouring colored foam into a hand-folded foil mold. The name Idea 32 comes from the 32 attempts that were required to find the right combination of materials. German designer Thomas Schnur presented a delightful collection of objects made using conventional materials. Schnu, who has a passion for no-frills design, used straightforward assembly techniques and one color for each object. The Fragment Table seen above was made with four metal brackets, four timber sections and rods, four plastic tracks, four plastic plugs and a table top -- they all lock together without screws or glue. The table has been painted in a very cool, retro-looking pale green. Taiwanese NBT Studio created a new line of cardboard furniture that also boasts an easy-to-assemble design. Dubbed "Reincarnazione", the furniture range is made entirely with eco-friendly materials such as ICB (Inverted Corrugated Board), PET fabrics made with recycled water bottles, and natural latex. Seen above is "Canvas", a comfortable sofa decorated with beautiful prints that can be fully customized. The sofa structure is made of ICB (Inverted Corrugated Board) and comes in a flat pack for a tool-free assembly. The cushions are natural latex and the upholstery recycled PET fabric. 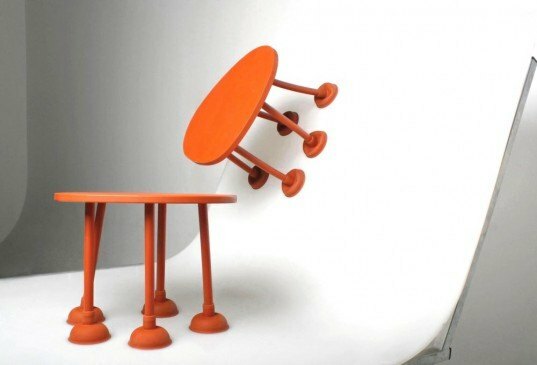 ﻿The Rubber Table by Thomas Schnur is a small coffee table made with standard rubber plungers and foam rubber, dyed to match the color of the plungers. The small table can be handily placed on an inclined surface and since it floats, it can also be used in the pool! "Outside In" is a table that recycles its own packaging. Made with white ash and plywood, the table comes flat-packed in corrugated cardboard that can be pulled apart and stacked in sheets to create a solid tabletop. The cardboard is slid into the top . 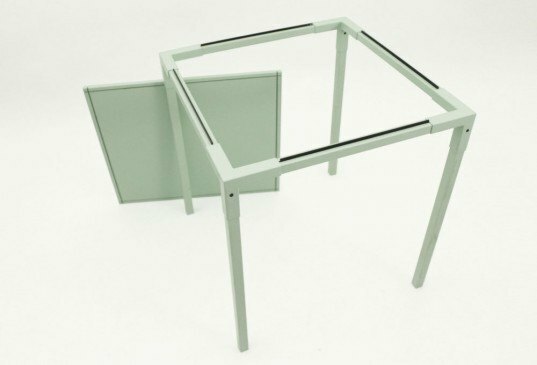 "Outside In" is a table that recycles its own packaging. Made with white ash and plywood, the table comes flat-packed in corrugated cardboard that can be pulled apart and stacked in sheets to create a solid tabletop. The cardboard is slid into the top of the frame and then clamped between two timber pieces with just four screws. This unique design comes from Design Soil of the Kobe Design University .